One of the priorities of the Latin American and Caribbean Center for Health Sciences Information (BIREME) is to promote access to information, evidence and knowledge in priority countries of the Pan American Health Organization/World Health Organization. This mission is undertaken through meetings with health authorities and research related to themes such as primary health care, scientific and technical information, human resource training, among others. During the month of October of this year, Dr. Diego González, BIREME/PAHO/WHO Director, travelled in mission to Guatemala and Honduras, two of the Central American countries which receive special attention from the Center, within the framework of the Work Plan developed by the Coordination of Countries and Sub-regions Office involving priority countries. During his stay in Guatemala, Dr. González held a meeting with the Forum of Deans of the medical schools of the country, as well as with the Primary Health Care team of the Ministry of Public Health. He had the opportunity of sharing the history of BIREME, its projects and scope, the amount of information and educational resources which can be accessed. Furthermore, with the virtual participation of the Center’s Technical Managers Renato Murasaki and Verónica Abdala, projects on Primary Health Care (PHC) were presented, such as an application still in developing stage aimed at facilitating access to information selected by specialists for health professionals dedicated to the first level of care and a platform of questions and answers on PHC developed by Brazil and potentially adaptable for Guatemala. During a workshop on Interprofessional Education organized by PAHO/WHO, the Ministry of Public Health and Social Assistance and the University of San Carlos de Guatemala, with the participation of professionals from the country’s universities and the Ministry of Health, Dr. González presented BIREME’s Strategy on Knowledge Management and offered to be a part of this Regional project. In Honduras as well, Dr. González’s agenda was rich in meetings, such as a day of updating for scientific journals in the field of health and related fields, which also received the virtual participation of Sueli Mitiko Yano Suga, BIREME’s Supervisor of Referential Information Sources. During the event, which was summoned by the Editorial Committee of the Journal of the Faculty of Medical Sciences and the VHL Committee, editors and authors of these journals were informed of BIREME’s new information products, the situation of the LILACS database and other projects of regional scope which strengthen scientific research and communication. The occasion was also favorable for a meeting among the teams of the General Directory of Human Resource Development of the Secretariat of Health and the Executive Directory of Technology Management (EDTM) of the Universidad Nacional de Honduras (National University of Honduras), during which possibilities were studied for alliances in information and knowledge management, as well as for joint projects for forming Teams of Primary Health Care. At the Faculty of Dentistry of the Universidad Nacional Autónoma de Honduras (UNAH – National Autonomous University of Honduras), Dr. González addressed a group of librarians from public and private universities, health institutions and others, sharing with them the new vision of BIREME to achieve equitable access to health information and to contribute with reaching the Objectives of the 2030 Agenda. Dr. Francisco Herrera, Dean of the UNAH, also held a meeting with Dr. González, which was an opportunity to congratulate the excellent work of the University’s National Medical Library team, not only in Honduras but in other Central American countries as well. In both countries the Director of BIREME met with the consulting committees of the Virtual Libraries, which exposed the progress of National and Thematic VHLs, the forming of Cooperating Center networks in each country, actions undertaken and challenges faced. According to Dr. González, “the meetings with the consulting committees highlight the importance of networking and guides us on the lines of work we must strengthen with each country in order for the tools and methodologies employed to facilitate access and visibility of the scientific information that is produced by our researchers”. He congratulated the effort and commitment of each of the teams and affirmed that BIREME will continue to support them, within the framework of collaborative work. Dr. Jackeline Alger, Coordinator of the VHL Consulting Committee in Honduras emphasized that “the VHL is an effective and dynamic means of accessing information; as a researcher, the VHL aids to universal health coverage by rendering accessible to professionals and citizens information which is essential for their own health care and that of others”. In both countries, Dr. González met with the Representatives and technical team of each Office, and he presented what BIREME is today, its priorities, products and services, and informed them on ways in which the Center can support each country and explore possibilities of joint work. In all the events, the Director of BIREME also diffused the Tenth Edition of the Regional Congress on Health Sciences Information (CRICS10), which will take place in São Paulo, Brazil, on December 4-6, 2018, with the theme “Advancing towards the 2030 Agenda: Contributions of evidence and knowledge”. 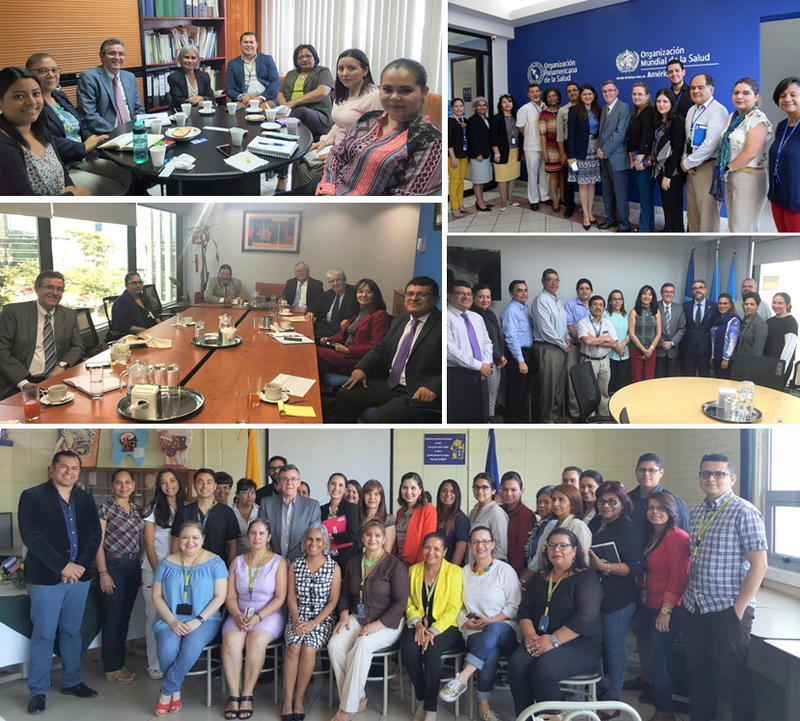 See also the news about Dr. González’s visit to the PAHO Representation in Honduras published on their institutional website.